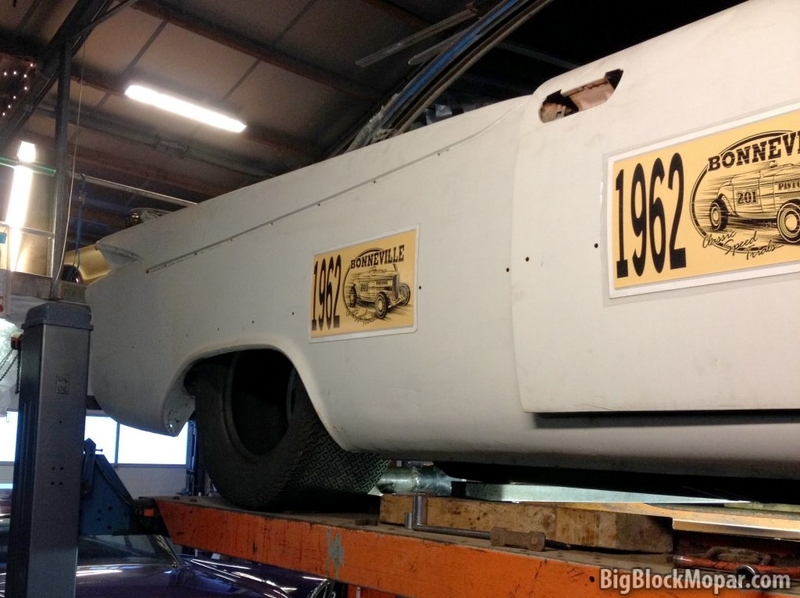 Viewing a thread - How Big Can I Fit on 60 New Yorker? How Big Can I Fit on 60 New Yorker? Subject: How Big Can I Fit on 60 New Yorker? 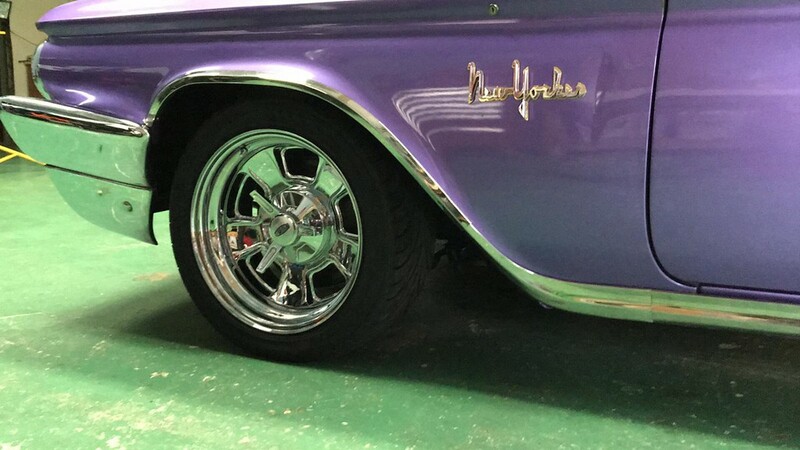 Im looking at a set of wheels for my 1960 New Yorker. Will these fit without any aggro, rubbing, or disconnecting anything to remove and replace. Subject: Re: How Big Can I Fit on 60 New Yorker? 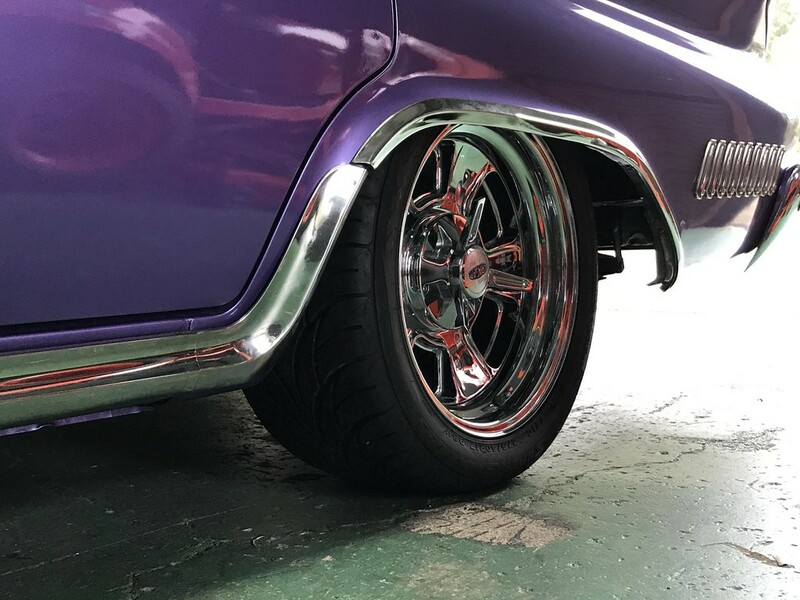 Location: Newark, Texas (Fort Worth) You might want to rent one of those tire sizing tools from a custom shop in you area.. Then you can figure out the absolute correct size without guessing and buying expensive shoes. If you do a lift kit, the sky's the limit! Absolutely serious, why wouldnt I be? Location: Southern Sweden - Sturkö island To each his own, but with a drop of 2", fat low profile tires and oversized rims, the ride might be a dissapointment. 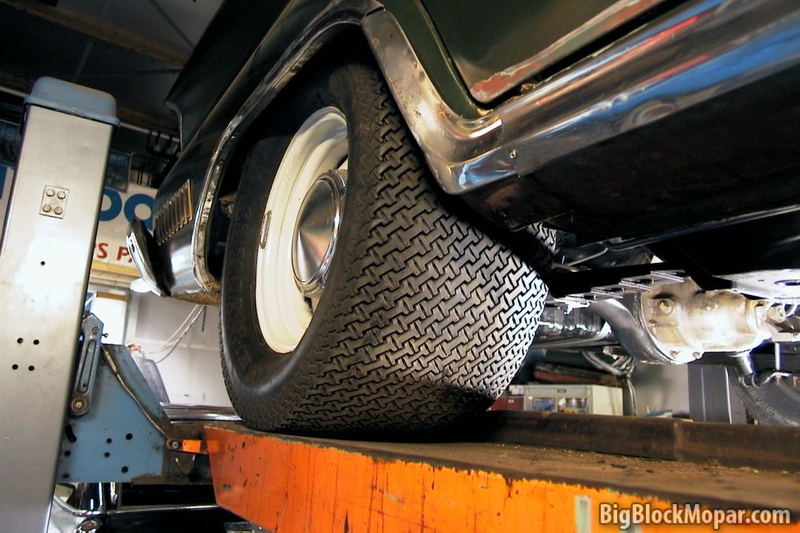 I hear lots of complaint about bad roadability on their GM cars with prarie schooner rims and low profile tires. Youngster like the looks and can tolerate the "exciting driving experience"
I presume that the torsion bars have been adjusted out of specs, so check the camber, it might be totally off with that kind of drop. The camber angles are perhaps too much for low profile tires. According to that site, the rear tires you are choosing are nominally taller but not enough to make a difference. Tape measure the wheel tub and if there is clearance for the width. The fronts are shorter and only slightly wider. You should have no problems fitting those if there is width in the wheel tub. Honestly, I can't remember off the top of my head. 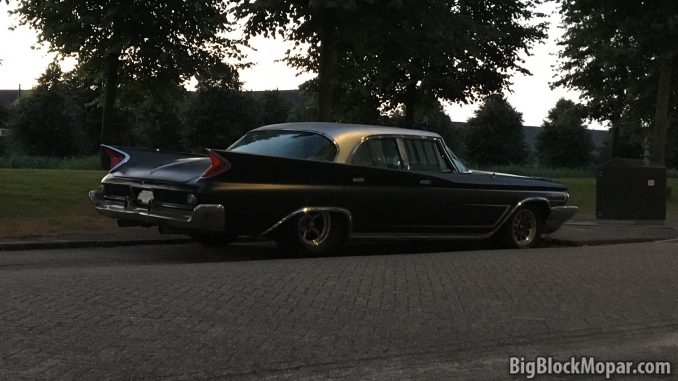 Location: Netherlands I can drive all day in and around town with speedbumps and all with the '60 NY and not hit anything underneath. The rear tires will rub very slightly when taking a sharp corner a little too quickly. A better front swaybar could prevent that but I'm aware of it and drive accordingly. My '65 300 convertible has 275/50/17" on the rear-axle without any issues. 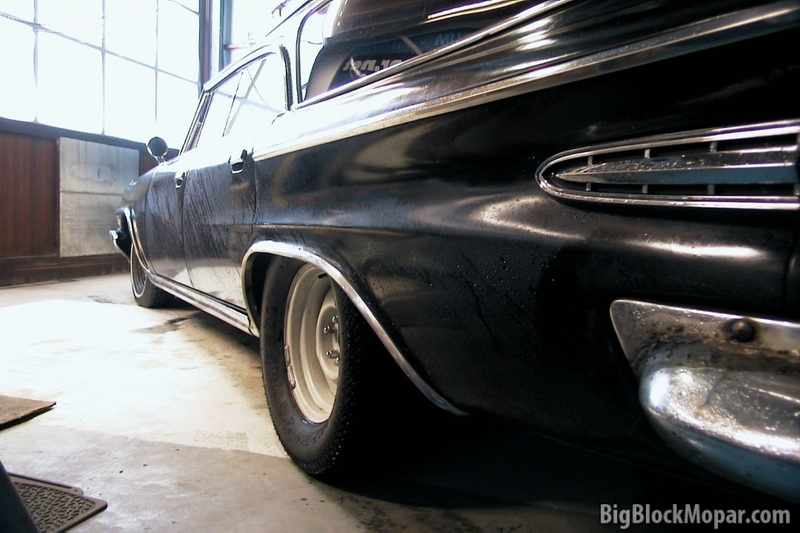 I can drive all day in and around town with speedbumps and all with the '60 NY and not hit anything underneath. Would love to see more pictures, looks great. The 9" rims have a 5" backspace, the 8" rim has 4.5" backspace. Stock 6.5" rims Ive got have 4.5" offset. Location: Netherlands The backspacing sounds about right. It's better to have slightly too much backspacing than too little. Too much backspacing can be solved with a thin machined spacer. The backspacing sounds about right. Might not be relative today. Offset? Not possible. Stock offset for these cars is usually 0.5". With 4.5" offset you couldn't even mount the wheels. Location: Netherlands There's also a big difference in "offset" and "backspacing". I recall my '64 NewYorker Salon had 6.5" wide wheels on it. Can you tell I like to experiment with large tires? Location: Sydney Thanks for the pictures! What is the rim width and back space youve used? Location: Netherlands Custom widened and backspaced wheel with 9" width. I seem to recall, at the time I made a calculation error and relied too much on the shop's experience doing the widening. As a result the backspacing of this pair of wheels was a little too much, and I had to run thin spacers to keep the tires from rubbing the leafsprings. Been a long time. IMO Chrysler positioned their wheels halfway in the available wheel-well, so 'usually' the 'proper' backspacing is half the wheel-width, with a little extra added to that. About 1/4" I think. Location: Sydney The 9" rims Im looking at have a 5" backspace. The 8's have 4.5" which appears to be what the original 6.5" rims are. Sounds like it should be about right I hope but maybe the 8's are a bit big for the front? Location: So. California I run 8" wide wheels on the front of my '58 Dodge. They are tight, but do work. Zero offset is where the mounting point is equally spaced inside to outside. Zero offset is equivalent to 1/2 wheel width + 0.5" for backspace. So a perfectly centered 9" wheel would have a 5" backspace.... i.e. 4.5 + 0.5 = 5. Location: Netherlands I usually run upto 235/60 tires up front on my cars. 275 on a 9" rim Cragars worked ok luckily. Wanted 4.4 - 5.0 backspace but ended up with 3.75. Just squeezed in nicely but would prefer bit more backspace. Plenty clearance on the inside, barely a finger on the outside. Location: Muskego, WI Great car CoolBanana, love the white over purple. 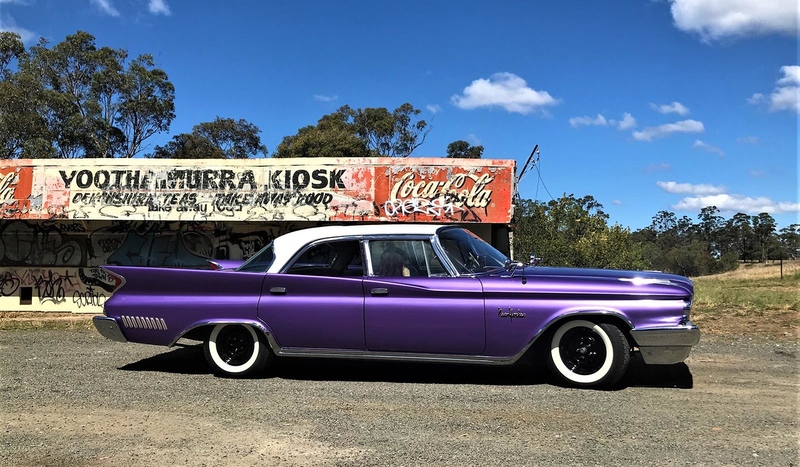 The 1960 Chryslers and DeSotos are about the best looking 4 door sedans ever made. How long have you had this car? Is it pretty stock? Great car CoolBanana, love the white over purple. 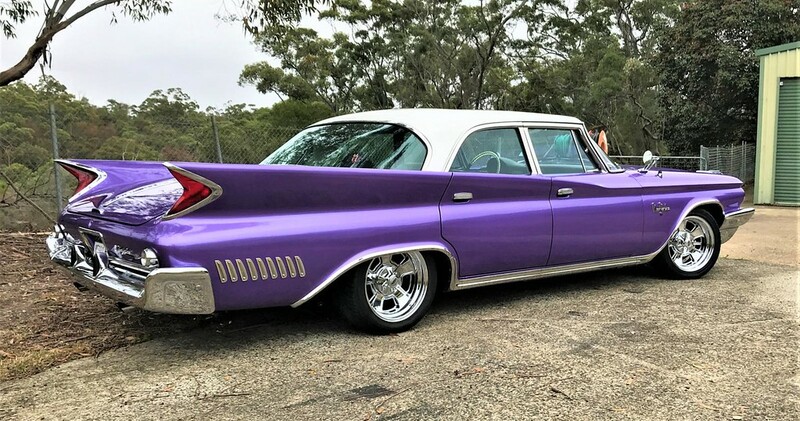 The 1960 Chryslers and DeSotos are about the best looking 4 door sedans ever made. How long have you had this car? Is it pretty stock? Havent had it that long but I reckon Ive put about 1000 hours into it so far! Its mostly stock apart from from dress up bits. Lots more to do as more funds become availaable, actually, does it ever end? In 1960, the roof, front window and rear window was the same for the 4 door sedan and the 4 door hardtop. This makes the sedan appears just as sleep as the 4 door hardtop. Yeah, I know and expect the "I told you so"
I tried and tried and tried with the 17" Cragars but could not get rid of the vibes or get the wheels to run true once mounted. Could not run at motorway speeds. I do appear to have a slightly bent left rear axle but its only a small amount, 0.5mm TIR axial on the mounting face. Nothing I can do about that for now anyway. The wheel have been balanced and checked for trueness but I cannot get them to mount successfully against the drum faces. 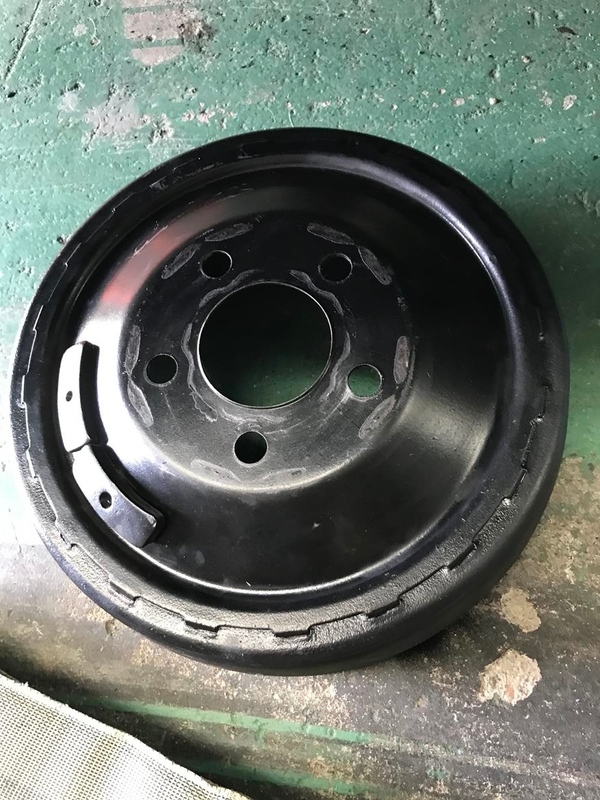 Ive checked the wheels themselves and they are fine but something is going on when mounting the flat face of the alloy Cragars to the drum faces. Re-fitted the stock steel wheels and all is well in the universe and feng shui has been restored again! I dont get it! Will try again with set of 15" steel rims and see how that goes. Location: Southern Sweden - Sturkö island If the rims have combination slots that will cover several bolt circles (won't fit any bolt circle good), then the center rings is a must (practically a ring that has the rim center diameter as OD and the drum hub diameter as ID with an appropriate height. I've just made one test ring for Keystone rims on a '66 Pontiac and it's a huge improvement. Location: Sydney It has correct stud hole spacing and I made some locating rings as well. It was a small improvement but only marginal not enough to be acceptable. Location: DFW, TX Some thoughts. Mopars of this era do NOT have a perfectly smooth drum surface. There are rivets holding the hub to the drum, and most (all?) have a locating pin for the factory steel wheels. I have to assume you have removed the large pin but the stamped steel wheels do have raised dimples in between the lug holes that allow space for the rivets. Do your Cragar wheels have indentions to allow space for those rivets? Make certain the lug nuts you are using are the correct type for your wheels. If using closed-end lug nuts, make certain they are seating the wheel, and not just seating against the end of the stud! Check wheel runout on a wheel balancing machine. If that is okay, check for a bad tire(s). My drums are not like that at all, they arent even the same from side to side. Mine has been modified in its life and the drums have been separated from the hubs. Aren't we talking 1960? In all these years working on 60s I've never seen a drum like that and I've never seen a locating pin on a FL hub/drum either. And never saw a riveted one, like the one you posted, just swaged like the last picture by the OP (use to be). Are you saying this is a 60 Mopar drum? Location: Muskego, WI I think the picture with the drums with rivets and locating pin is earlier as it uses wheel bolts instead of studs. Wasn't that the approach for 1957 or 1958 Plymouths? I'd be wondering on tires meeting leaf springs. Cool purple. I once had a '71 Plymouth Satalite Sebring Plus, 440 hp, slap stick yep it was fast. Thing had them little 14" rims. I tried putting in 15" but could not find a combination that would work. Had a set of crager deep dishes, and unless low profiles were put on would not clear fender wells. Sorry but I am not a fan of slam it down with big hoops. I want some side wall flex when me in the go faster mode. Location: Locked in my Canadian garage.... 1coolbanana.... what lugs were you trying with the aluminum wheels? 60 degree taper or? 1coolbanana.... what lugs were you trying with the aluminum wheels? 60 degree taper or? Standard conical seat on the Cragars. And was using standard type conical seat lugs. So the wheel should in theory center with the lugs on the studs. I actually like the look of those wheels on your car. I wonder if axle runout bad but would be the same regardless of which wheels were mounted. If the wheels fully seat on the drum over the hub... must be in the wheel? 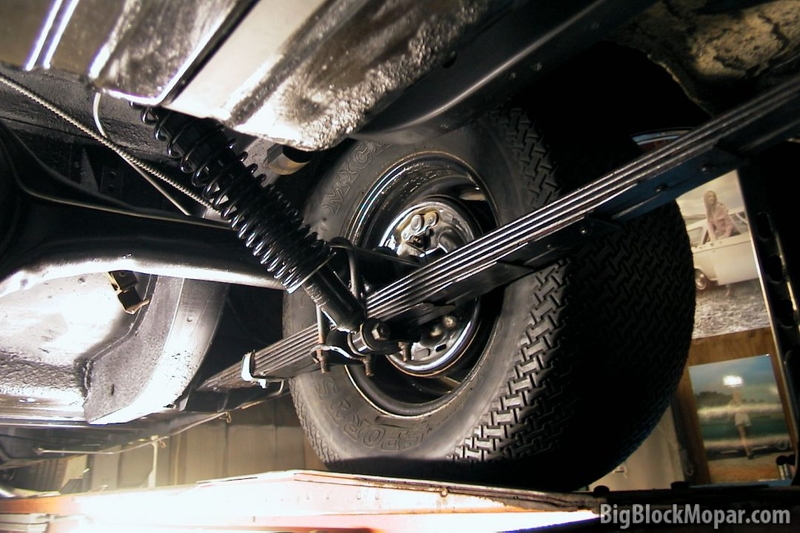 Have you tried mounting the wheels on another vehicle and seeing if it drives smooth or not? Location: Sydney Yeah, I liked the look of the wheels but 17's were a hassle to get the correct size tyre, I couldnt get rid of the vibes and so I moved them on. 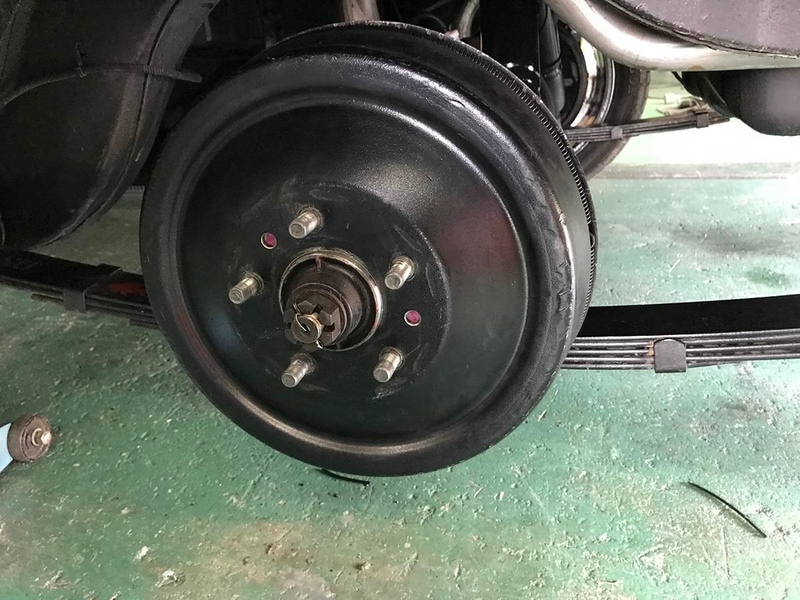 Im running stock steels and although the rims have the same runout, the big sidewalls seem to take up the slack and its not a problem cruising on the freeway whereas I couldnt do that with the Cragars. The axle is a problem and is the next thing on the agenda to fix but Im concerned about a way to fix it, depending on what I find when I take it apart. Parts are non existent here and anything from OS takes weeks if not months even if I can find a replacement part, axle or hub and drum etc that is and I fear it will be off the road for a while if I take it apart. Location: Locked in my Canadian garage.... Egads you are in Australia or?? I just bought an 8 3/4 rear last night, drum to drum with good brakes and shock plates included. Cost me a bottle of rum. Parts are cheap here.